Today, Veg Bowl completes 5 years of blogging, crossing yet another milestone that I am immensely proud of. Ever since its commencement since March 15th 2009, the journey till here has been fabulous and entirely satisfying. Like in any relationship, in this journey too there were highs and lows, ups and downs that made it difficult to tread the path - yet the love, the faith and the passion endured and so it succeeded. It’s hard to believe that Veg Bowl is 5 years now with 250 posts. When I sat down to put together this post I had a hard time to begin this post with. Words did not flow so easily. I was stirred emotionally. You see, over the several posts in the past, I have never thought over so much as much as I did for this one. Nor had I spent so much time reading through my previous blog posts. Nostalgic as I may say, each post reminded me of the time and effort I had spent over each dish, each post; some to create, many to photograph and others to draw a story for the board. Each has its own story to weave. Over these years I spent in blogging, I have learnt a lot and matured in the process. It bettered me as a cook, as a photographer, and as a story teller. There were many moments when I assumed I would no longer be able to pursue blogging because I was so pressed on time, work pressures and personal demands of life that it felt almost impossible to chase this passion. These were times when I was pregnant and I hated food or its sight, when I became a mother and nurturing my baby was the most important, when I switched jobs and I was busy unlearning and re-learning at work, when I brought back tons of workload home and that kept me occupied for weeks and weekends, when I had to baby sit the toddler all by myself and manage home unaided, when my husband was out of town for weeks and our life demanded more attention to other important matters than just hobbies - these were times I put aside blogging for those whiles. But there was sincere love and an enduring faith that helped me succumb to this appetite of blogging as and when time permitted me. I pursued it not under pressures of being active as a blogger, but as a medium to catalyze my culinary creativity that would help me unleash the diurnal pressures of life. Even during these moments I cooked a lot, but I probably did not make time to photograph or post them. Yet with all these failing reasons, I am here because I just love being here and doing what I love the most. Cook. Click. Share. Over these years, I have received incredible support from many. A special mention to my husband for all his patience and care shown towards me during the time I am shooting, processing or blogging. Its his constant support and motivation that has inspired me to come this far. My parents, family, friends and many near dear pals have always extended their relentless motivation, many being positively critical about my work. I geared a lot of love and respect from many known and unknowns. The mails, the requests, the thank you notes from you readers have always made me feel special. Your comments aspire me to do better. Keep them coming so that I can keep myself going. Thank you all once again for all your love and Happy Birthday to Veg Bowl. For this special day, I have some warm and delicious Breakfast Knots for you all. 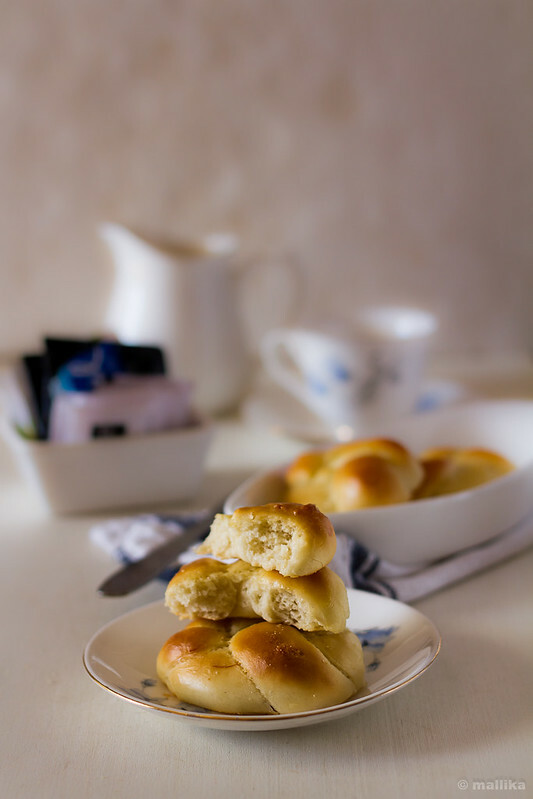 These are buttery and delicious and one of the best breads I have baked recently. Bake them in your kitchen and share them with a dollop of butter or jam with your family over cups of steaming hot tea or coffee. I am sure it will bring in more love and warmth that will help your day going. In a small bowl, dissolve the sugar in warm water and then add yeast. Let this stand for at least 10 min till the yeast is frothy. After 10 mins, the yeast should have frothed and bubbled up. Now add melted butter, salt and warm milk to this frothed yeast and stir well. Introduce the flour into this mixture and stir using fork till a coarse ball of dough forms. Alternatively you may use a stand mixer with dough blades attached for this purpose. When the dough comes together, turn it out onto a lightly floured surface and knead until smooth and elastic, about 8 to 10 minutes. If the dough is too sticky, add a tbsp. flour at a time and knead it gently. If it’s too stiff to handle, add a tbsp. 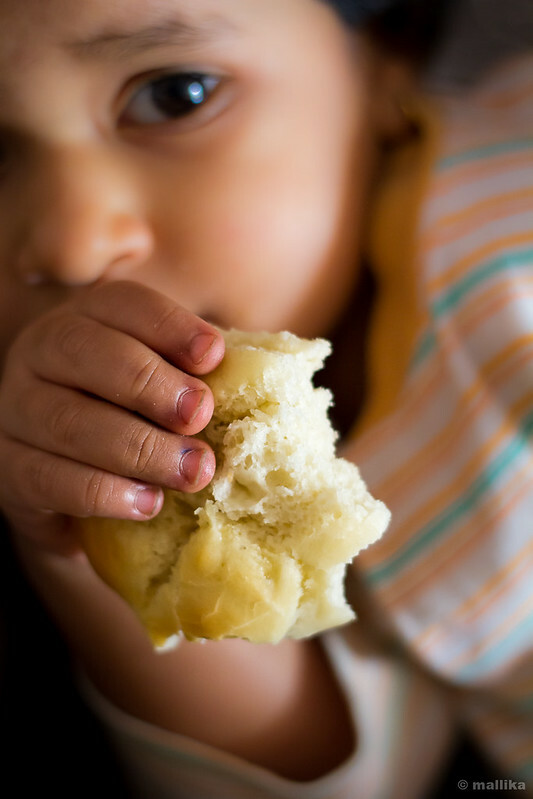 of milk at a time and knead well. Place in a oil greased bowl, cover and let rise in a warm place until it has doubled in size. This takes about 2 hours. Once risen and doubled, punch it down. With little or no extra flour divide the dough to 6-8 equal pieces. On a clean work surface, grease your hands with vegetable oil or butter. Next roll one piece into a 10-inch-long rope. Tie the dough into a loose knot with about 2 inches of dough free at each end. One free end of the dough will go over the knot and get tucked into the center, while the other free end will be tucked under the knot. Ensure they are securely fasted between the knots so that they don't open up while baking. Place them on the baking tray and allow to rise and double for another 1-1/2 hours. 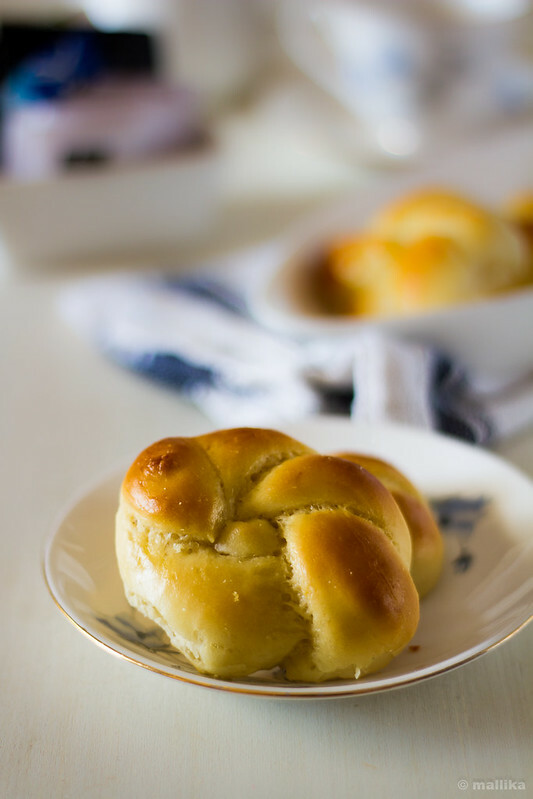 Brush milk over these bread knots and bake in a pre-heated oven of 180 deg C for about 15 minutes. Remove after 15 min and brush more milk on top of these knots and bake further for another 5 minutes. The knots will be baked to golden brown hues. Remove from oven and brush some warm melted butter. This helps in keeping the bread soft with a lovely soft, supple crust. Serve warm with butter and jam for your breakfast or with soups for your dinner. Also, Happy Birthday to our dear little princess daughter who turns 3 today. You make our life so special and worthy! Wish you loads of love, luck and happiness! Happy Birthday VegBowl!! Wishing you many more such successful yrs to come,best wishes for that!! Incredible passion and dedication towards something which does not earn u anything but simple joys of other bloggers' feedback and appreciation. I hope you pursue this passion for many years something which will be part of your life and you will be known for this..Hats off..Keep up the Good work and Happy Bday Lil princess Ridhi and Vegbowl !! 250 posts!?!?! Wow, that's crazy (lots). GREAT job! I wish you increasingly more and more success in your beautiful blog. The breakfast knots look delicious too. Happy 5th! May you celebrate many, many more. Your daughter is precious - happy birthday to her too!